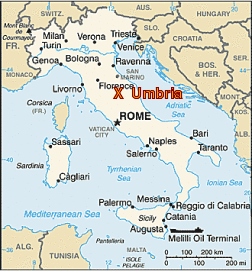 Umbria is a land-locked region of Italy just north of Rome and southeast of Tuscany. The map below provides a very rough idea of its location. 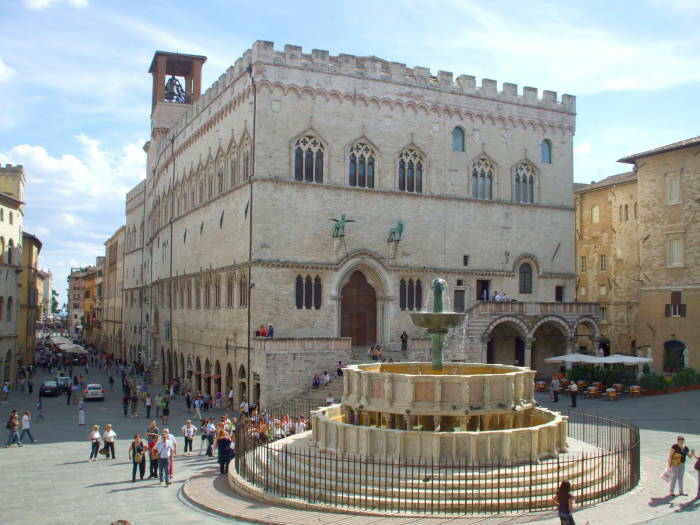 Perugia is the capital of Umbria. 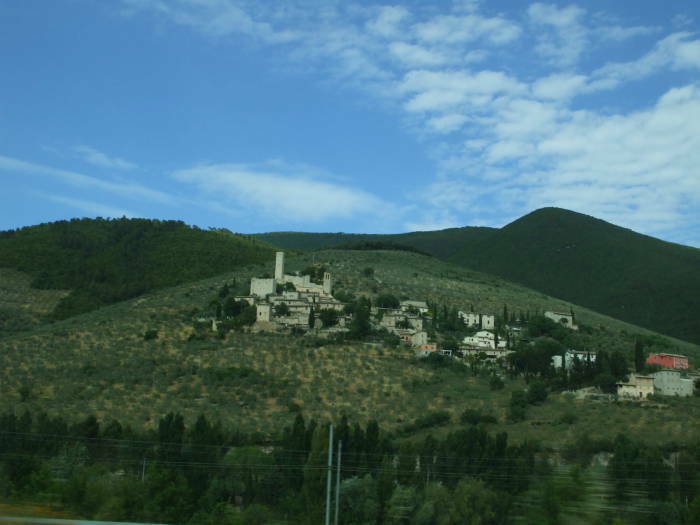 Major towns include Spoleto, Orvieto, and Assisi. 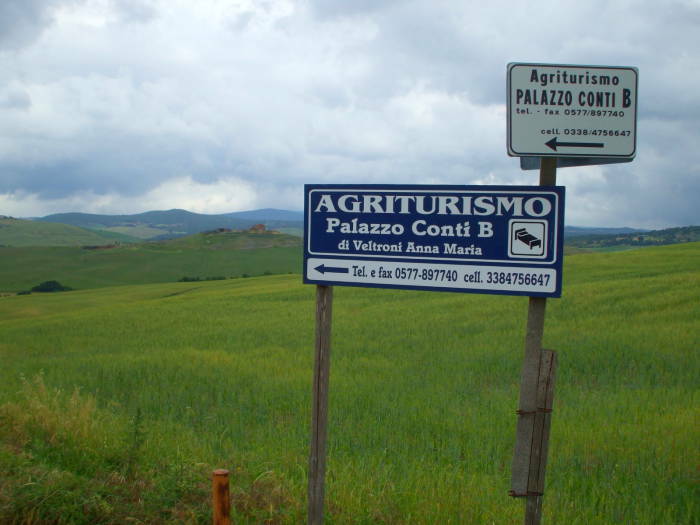 However, a great deal of Umbria is fertile countryside dotted by agricultural villas. 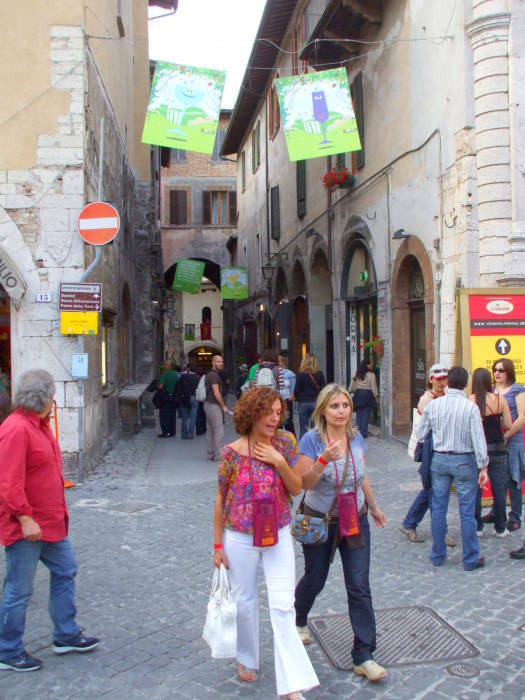 Corso Vanucci is the main boulevard through the old city of Perugia. Its north end passes the Palazzo dei Priori and the Fontana Maggiore — the Palace of the Priors and the Great Fountain — and ends in Piazza IV Novembre. Here is the Fontana Maggiore and the Cathedral of San Larenzo. Construction of the cathedral started in 1345, although a church had stood there since the 900s. The modern country of Italy is a fairly new thing, with the peninsula organized under one government only in 1870. From the time the Roman Empire fell apart starting in the late 300s until then, the peninsula of Italy was a collection of many Papal regions, colonies of other empires, and powerful city-states, including that of Perugia. 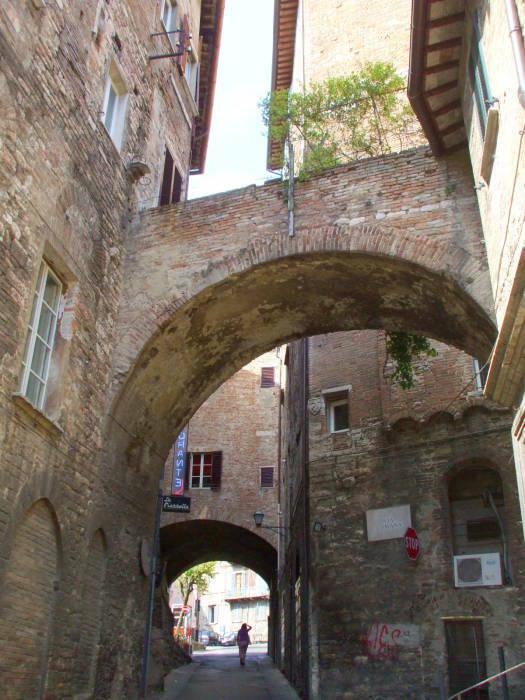 The leaders of Perugia decided that they should go to Chiusi in force and steal Mary's engagement ring so that Perugia could get all the benefits. Not just the income from pilgrimage tourism, but also the sacred bonus points for owning such a relic (and how that favor might be offset by their having stolen the ring through military force didn't seem to enter into the equation). So, they attacked Chiusi in 1473 and stole the ring. 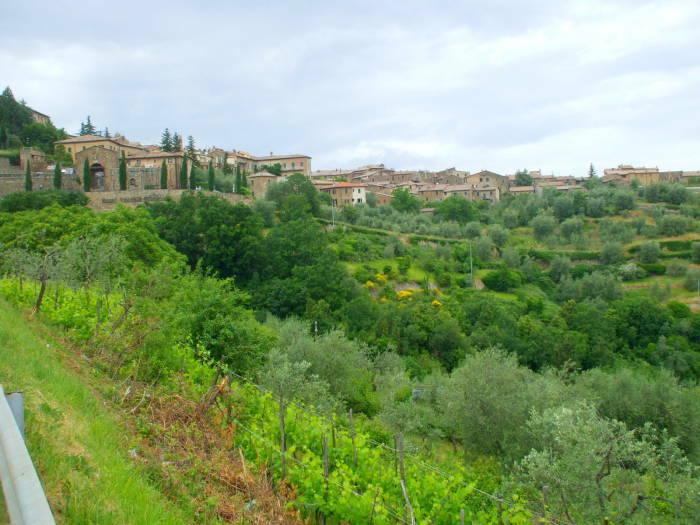 Their immediate worry was that a bigger city, maybe Florence, would then attack Perugia and steal the ring away. So they should get a local blacksmith to make a very sturdy box that would be attached into the stonework of their Cathedral of San Larenzo and locked with a strong lock. Cesare Borgia — do not give the key to this guy! But then who would hold the key to the lock? This was the era of the Borgias and conspiracy was common in Italy. No single person could be trusted to hold the key to the box. So the blacksmith was directed to make a fairly large iron box with straps to be fastened around structural elements of the cathedral. The box had a very large hasp with fifteen holes, and fifteen locks were then used to lock the lid closed. Fifteen reasonably trustworthy citizens were selected, and each received the key to one of those locks. So, a few times a year, at the pilgrimage seasons, these fifteen reasonably trustworthy citizens brought their keys to the cathedral, collectively unlocked all those locks, and the ring was displayed for the visitors. This is related to modern problems of cryptographic key sharing, including the math for an M-of-N key sharing algorithm. Beware, references to peer-reviewed journals and some mathematics are involved. The ring is still locked away there, visible just a few days each year. 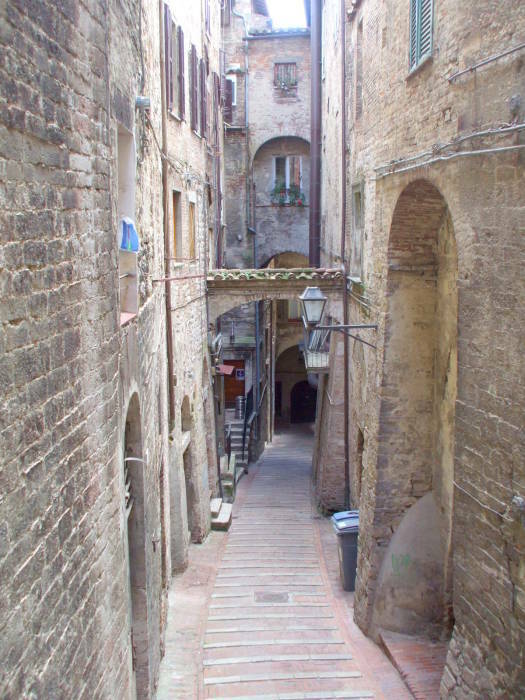 Below are some of the narrow and steeply sloping streets and passageways of Perugia. The buildings are old, many of them 400 to 600 years old, but even back then the city was being built up and not out. The result is narrow passages and archways overhead, with the sky barely visible in many places. 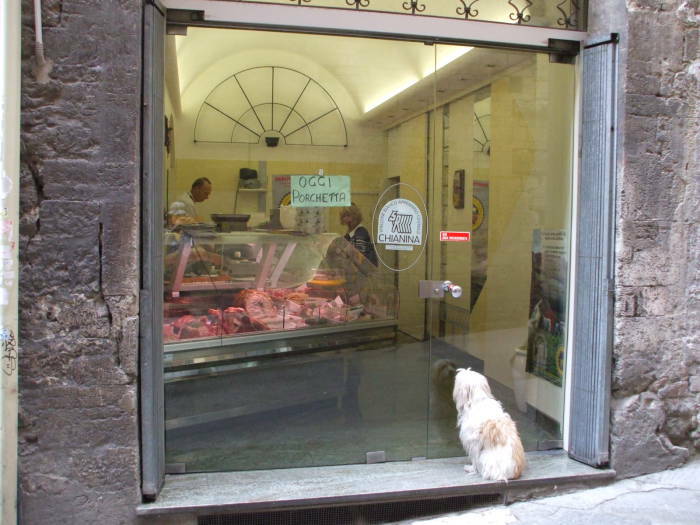 This dog hopes that his master will share that tasty meat! 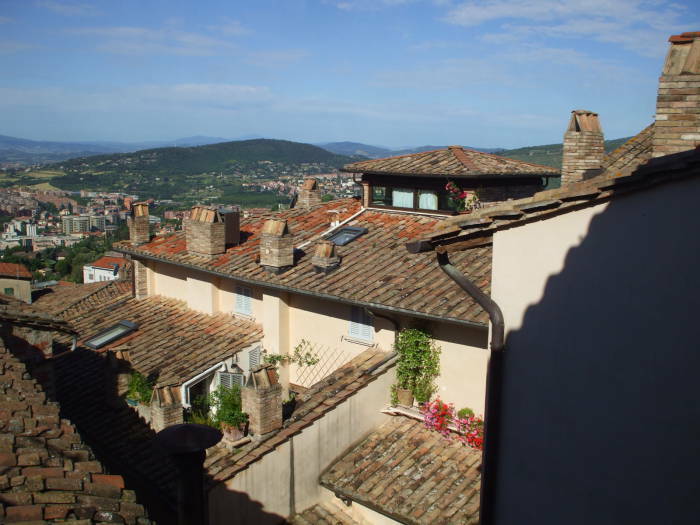 The bedroom windows look out over the tile rooftops of the old city, down over the newer town and university district, and out across Umbria. 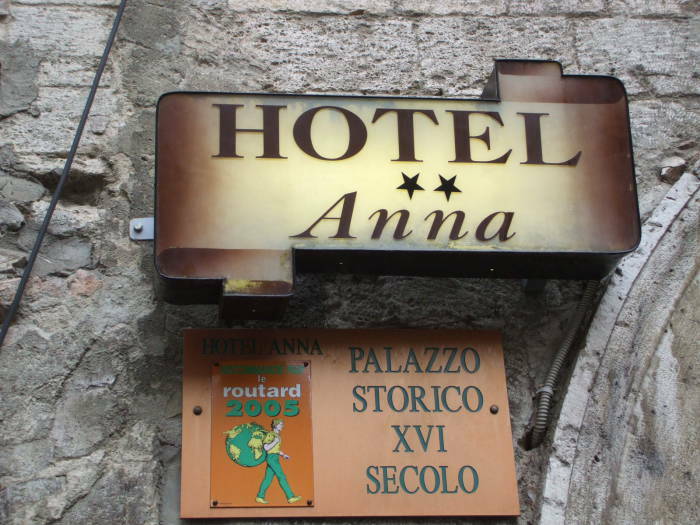 Anna and Papa give you the feeling that you are staying with an aunt and uncle that you never realized you had. And you do not go hungry at breakfast! 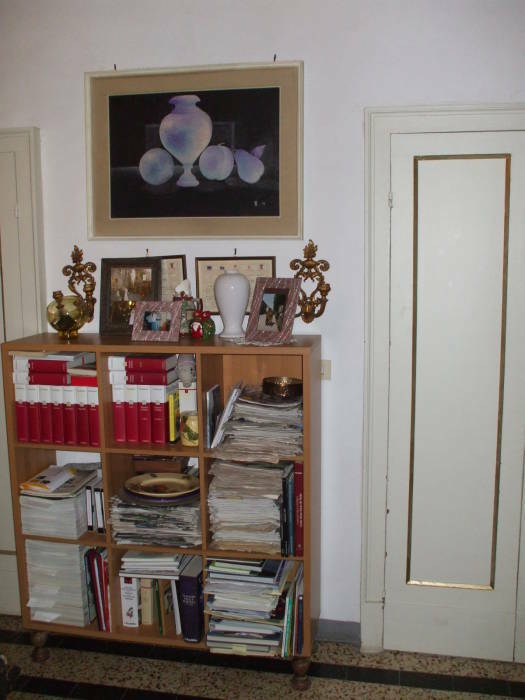 You may have noticed above that there are a few pictures on the wall. You are definitely staying in someone's home. The many bookshelves in one of the common rooms hold a set of encyclopedias and some stacks of old magazines. In addition to all the art on the wall, you also find things like their son's scuba certification. It's very homey! 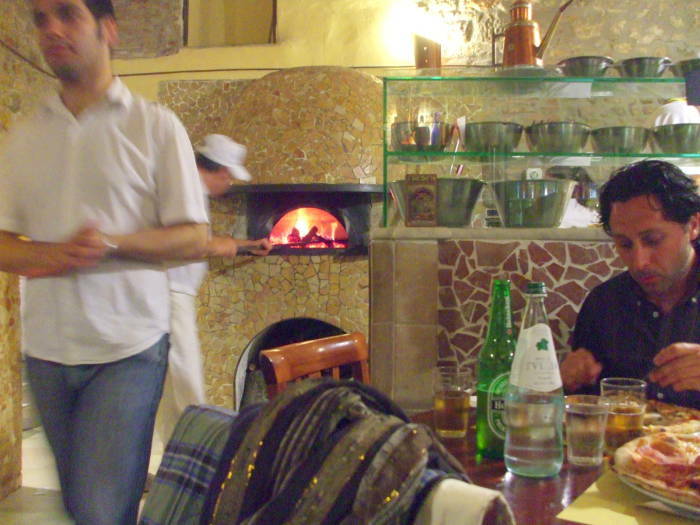 Pizzeria Mediterranea is a great place for dinner. 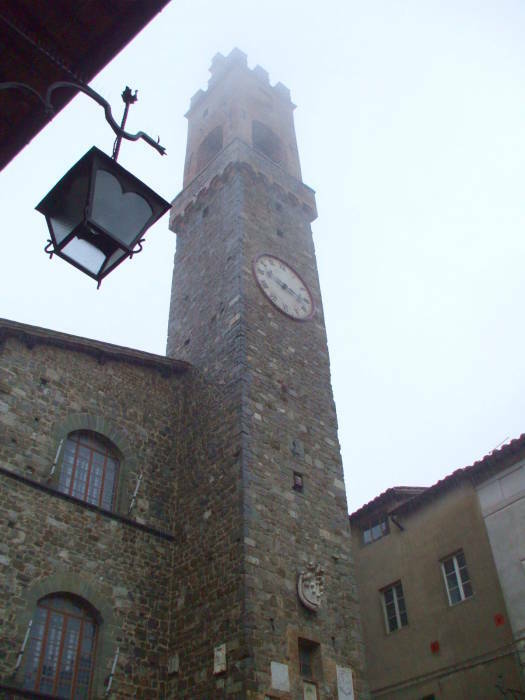 It's at the lower corner of Piazza Piccinino, just up from the cathedral and around the corner. 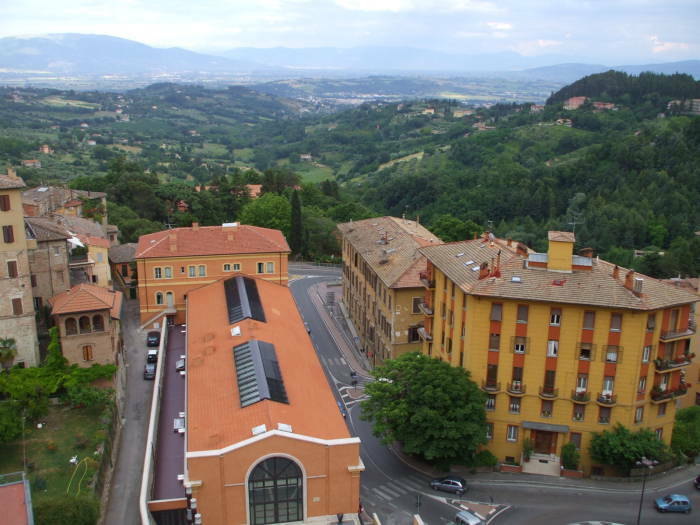 As for getting around Perugia, there are two interesting innovations. In many European countries, settlements grew up in places with transportation advantages, and this usually meant along rivers. They were intended to be easy to get to, to support trade and travel. 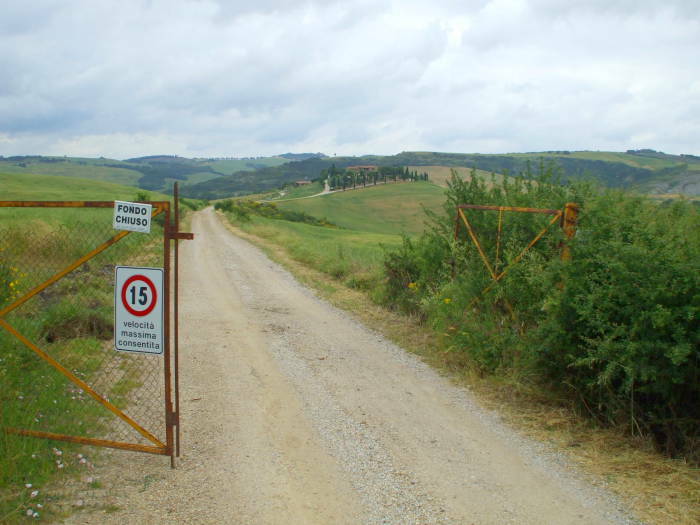 However, the peninsula of Italy was a very different environment with very different concerns. There was no overall government. The peninsula was made up of the Papal states, many city-states and the territories they controlled, and a few large territories controlled by foreign national powers. All those independent regions fought back and forth. 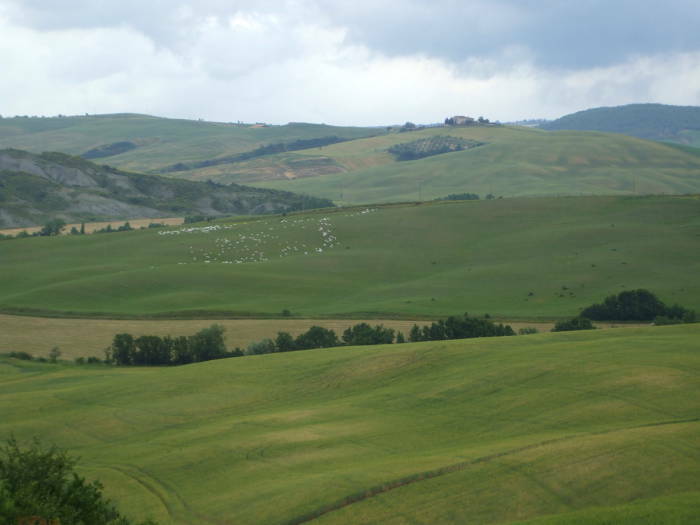 Settlements in Italy were located and laid out for defense. 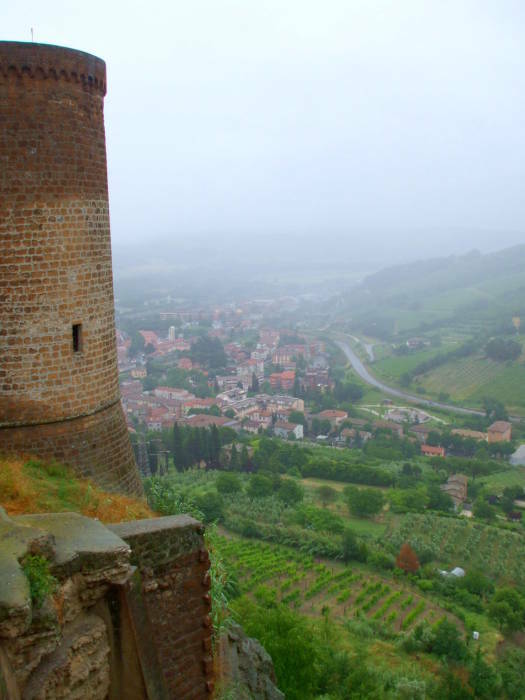 Most are hill towns that would require an attacker to approach while struggling up some steep and tall slopes. 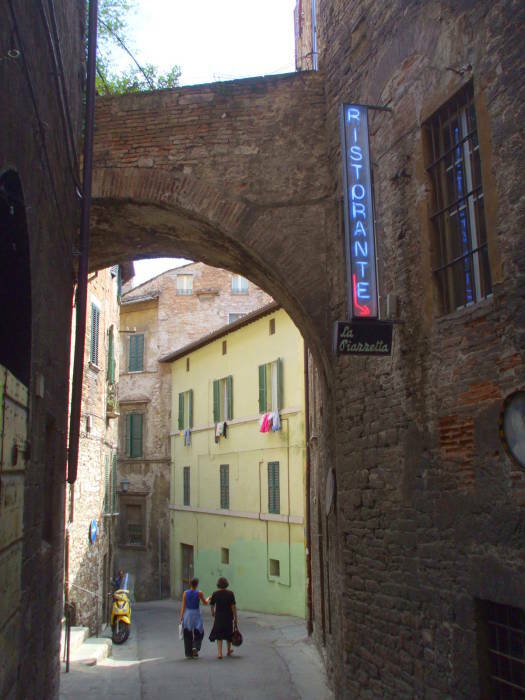 Perugia is no exception. The central old town is about 170 meters higher than the train station. These days there's little concern that the Pope's army will come riding through, or that Siena is going to launch an attack to steal that ring. But the hill is still tall. 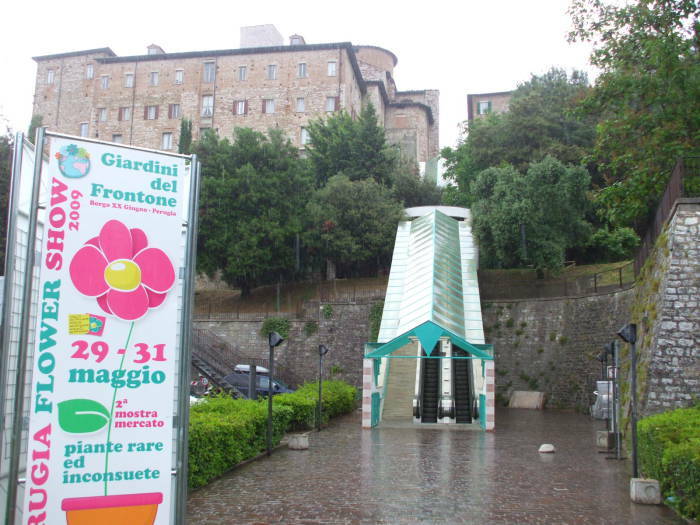 Perugia recently installed a set of outdoor escalators to take you from the old town to a parking lot part-way down the hill. 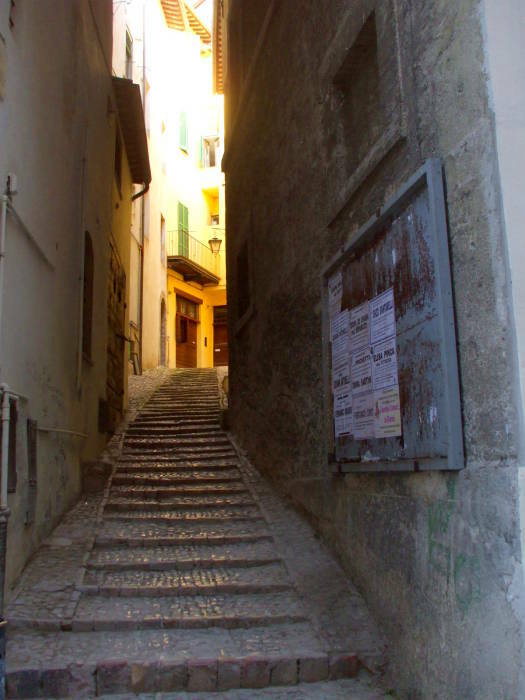 The top of the uppermost escalator is just two blocks down Via dei Priori from Albergo Anna. Two escalators take you to a parking lot where we kept our rental car (vital to see anything beyond major cities). 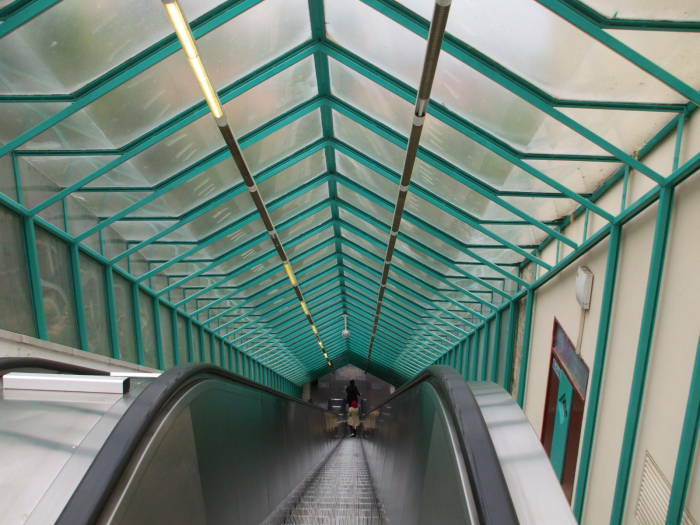 The next escalator takes you the Mini-Metro, a completely automated futuristic transport system. You buy a ticket from a machine and use that to get through the turnstyles. A small car soon arrives, glides to a smooth stop, and opens its doors. You get in and off it goes. It's completely automatic, there is no driver. 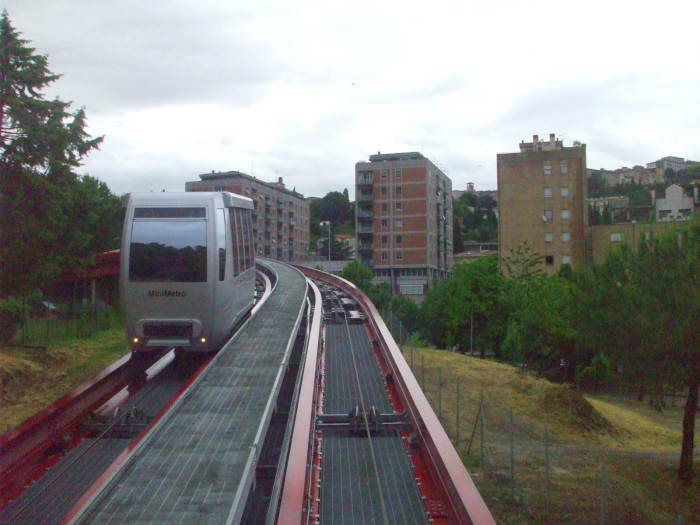 Several of the little cars travel along the Mini-Metro line, so it is always a short wait for the next one. The Mini-Metro is clean, fast, efficient, and very low cost to ride. 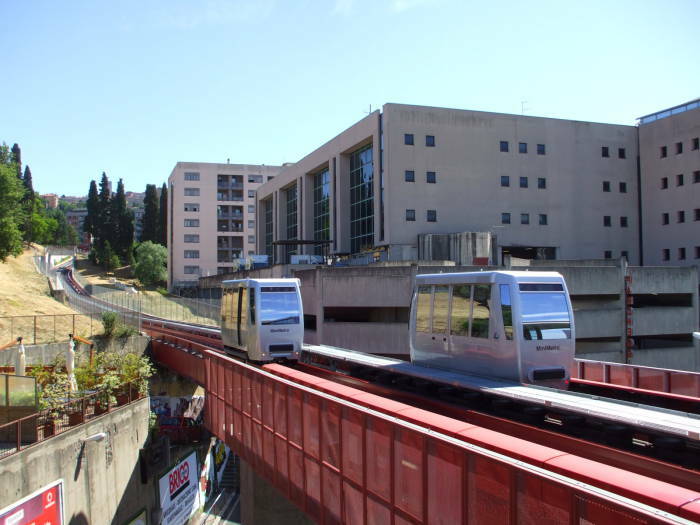 As the little cars are moved by a set of cables, the system of cars can use itself as counterweights and minimize the energy needed to operate the system. It's very impressive, advanced well beyond any public transport system I have seen in the U.S. 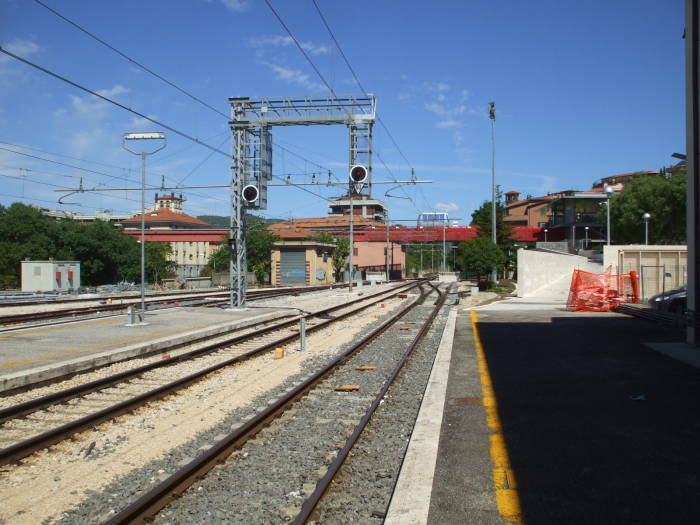 In the first picture below, you see the Mini-Metro crossing over the rail line at the main station. 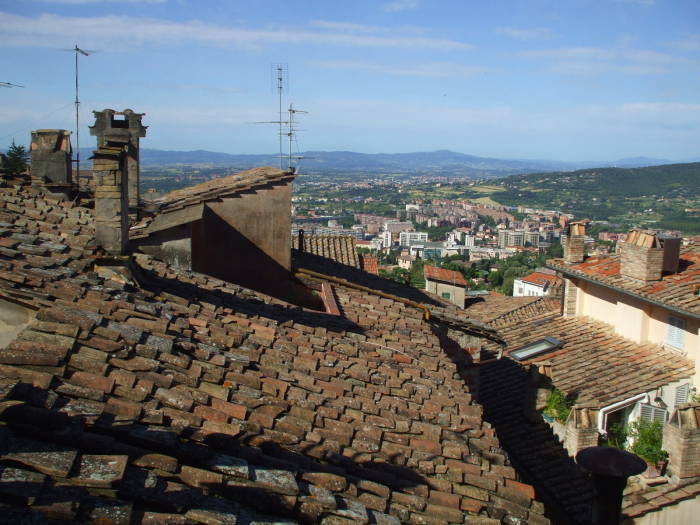 In the second picture above, we're on an overlook on the edge of the old town looking toward Assisi, part-way up the large hill at the far left of the picture. That's the next stop. 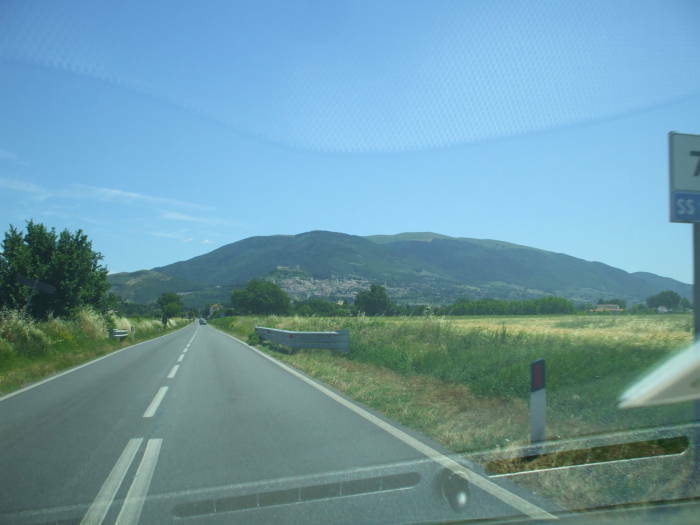 We are driving to Assisi, a short drive south of Perugia. 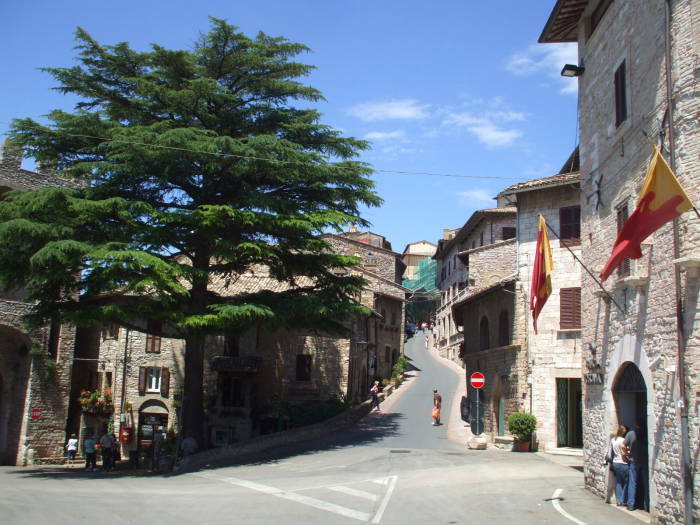 The town is visible about a third of the way up Monte Subasio (1290m). 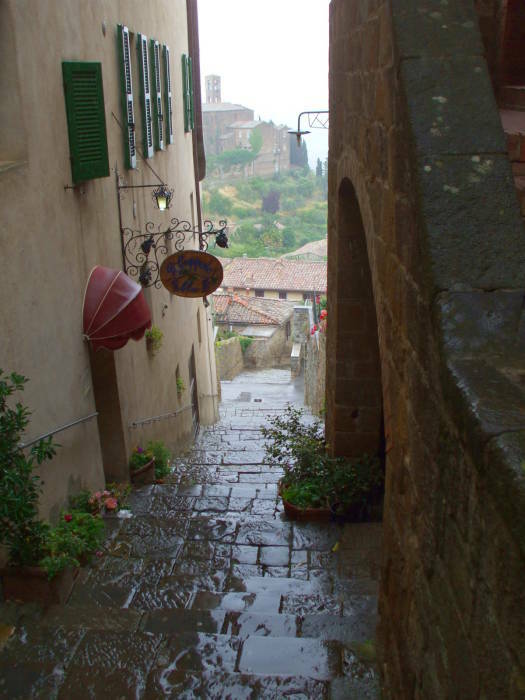 This is one of the steep streets leading up into town from one of the gates through the outer walls. 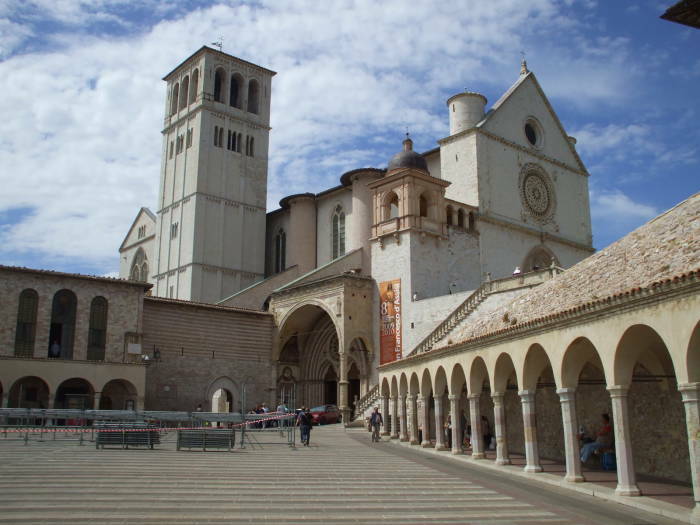 Assisi is the home of San Francesco, or as we call him in English, Saint Francis. Francis, really Giovanni Francesco di Bernardone, was born here in 1182. 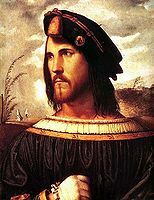 He was formally named Giovanni, in honor of John the Baptist, but his father was a wealthy cloth merchant and started calling his son Francesco, apparently because of his commercial success in trading with, and his enthusiasm for, the French. Francis was involved in a few military misadventures typical of the time, and then had a strange vision and a religious awakening. 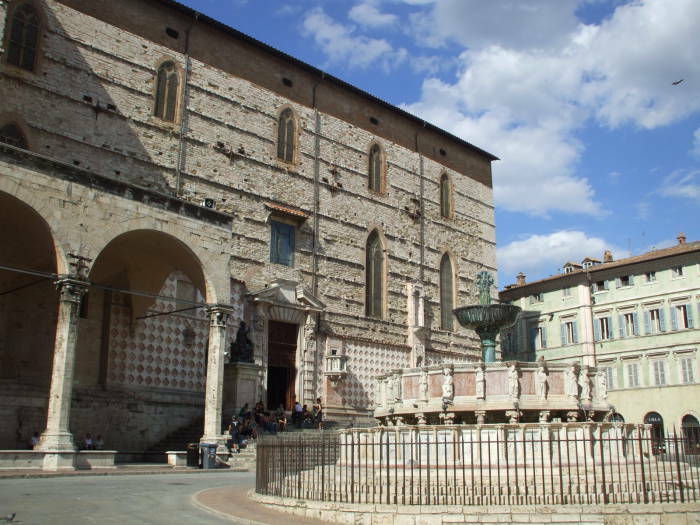 He renounced his father and his father's wealth in a spectacular episode that had him stripping naked in the main square of Assisi in order to divest himself of everything associated with his family's financial success, including all his clothing. Before the trip, I was just vaguely aware of Saint Francis of Assisi as being associated with animals. The more I read about him in preparation for the trip, well, the stranger he seemed. An extremely pious and inspired man, yes, but kind of extreme. 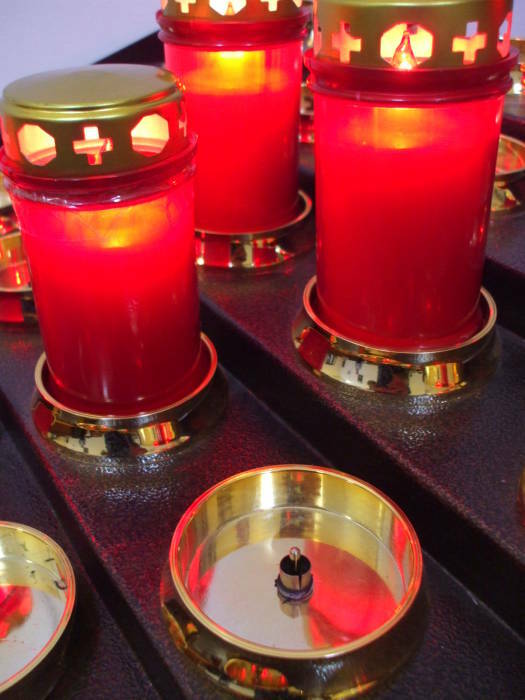 These 12 volt "candles" are becoming common in Italian churches. The idea is that you make a donation and then light a candle. But instead of lighting a candle, which has to be replaced, you plug one of the red glass "candles" onto the RCA audio plug and illuminate the cluster of LEDs inside. At some point an attendant comes around and unplugs most of the "candles" in preparation for the next visitor to the chapel. Francis, or Francesco, died at the age of 44 in 1226. He had been sick, in worsening health for some time, and he died on the floor of his mud hut "with his Holy Lady Poverty". His followers knew that they had to hide his body quickly, because this was the 1200s. When word got out that an especially holy man had died, the relic hunters would be on their way to cut off a piece. Really. Francesco's followers buried him on the outskirts of town and the construction of a cathedral started almost immediately. A cathedral was built over his tomb in 1228-1230, with the first stone laid by Gregory IX, the Pope at the time. As soon as it was finished, there was still a lot of money and enthusiasm for further building. Unfortunately, in the eyes of those not involved in the 1228-1230 construction project, there was a complete and rather large cathedral already in place. Then someone had an idea: "Why don't we just stack a second cathedral on top of the first one?" It wasn't until 1818 that they found Francesco's tomb down in the crypts underneath the Lower Church. 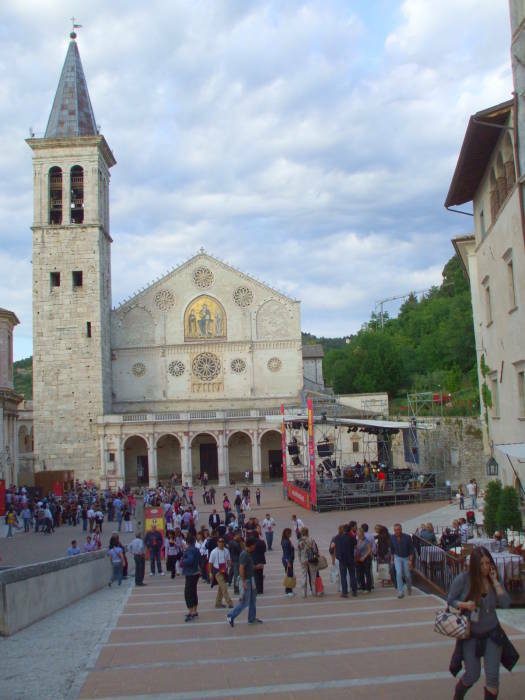 Spoleto is in southern Umbria, about an hour's drive south of Perugia. It's surrounded by rich agricultural land, and it's the site of several festivals throughout the year. 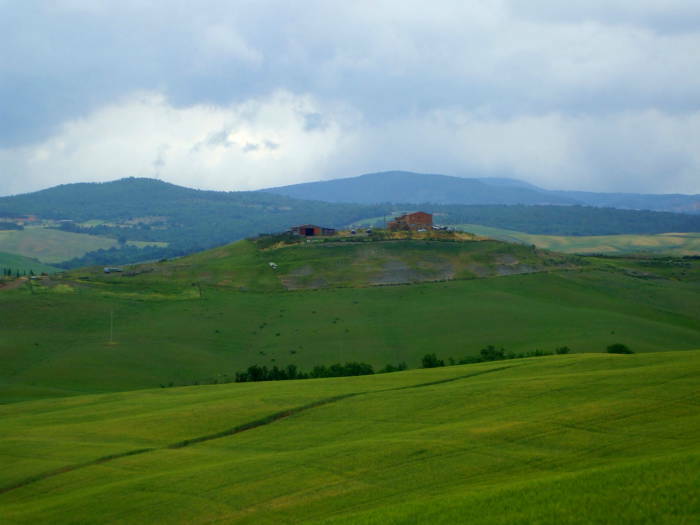 Its Rocca Albornoziana is a fortress built as part of Pope Innocent VI's military struggles to take control of all of Umbria. A wine festival was going on. Participants got a wine glass and a carrier to more easily move from venue to venue. See the purple pouches. Bands were set up all around town, including this one in the large square in front of the Cathedral of Santa Maria Assunta. 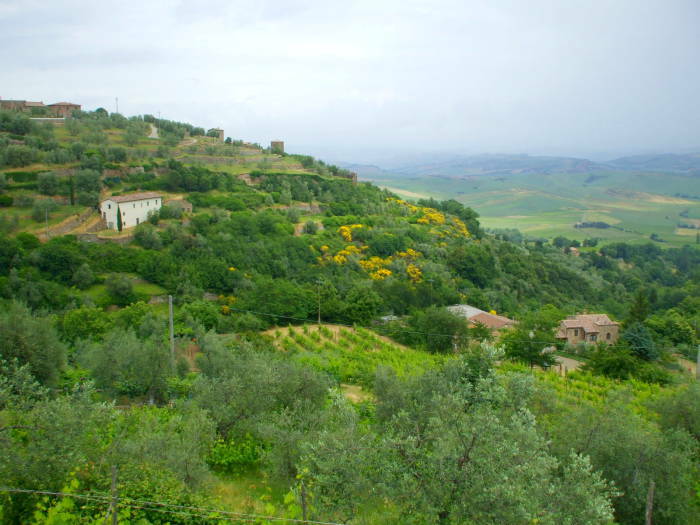 Orvieto is in southern Umbria, close to the border between Umbria and Tuscany. 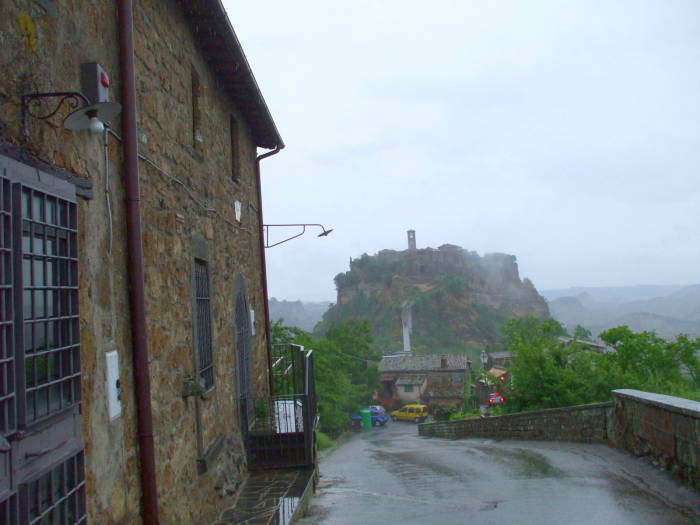 Just south of Orvieto, and actually just across the line into Tuscany, is the town of Bagnoregio and the tiny village of Civita di Bagnoregio. 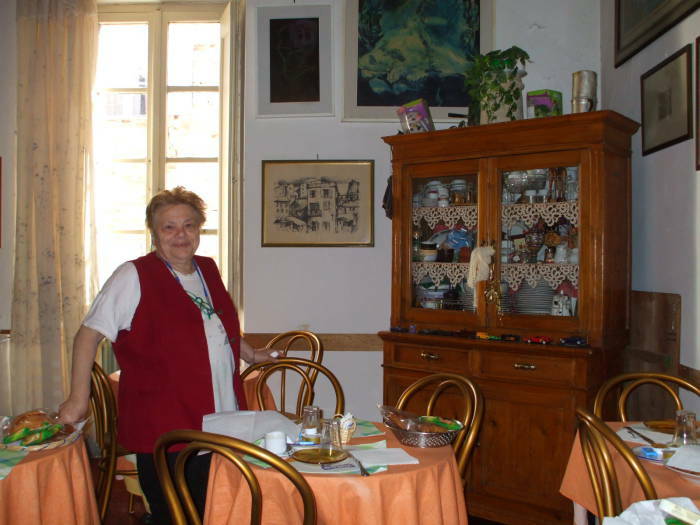 Civita di Bagnoregio is very small, with just 20 residents year-round and up to just 300 over the summer. It can't get any larger, as it's on a small pinnacle of stone. The only access is via a narrow footbridge 300 meters long. Only two motor vehicles are allowed in and out over the narrow bridge — a small Fiat used to transport the elderly and infirm, and a mini-tractor used to bring supplies in and trash out. Orvieto is also on what appears to be a nearly cylindrical volcanic plug, although not nearly so small and not as extreme as that of Civita di Bagnoregio. 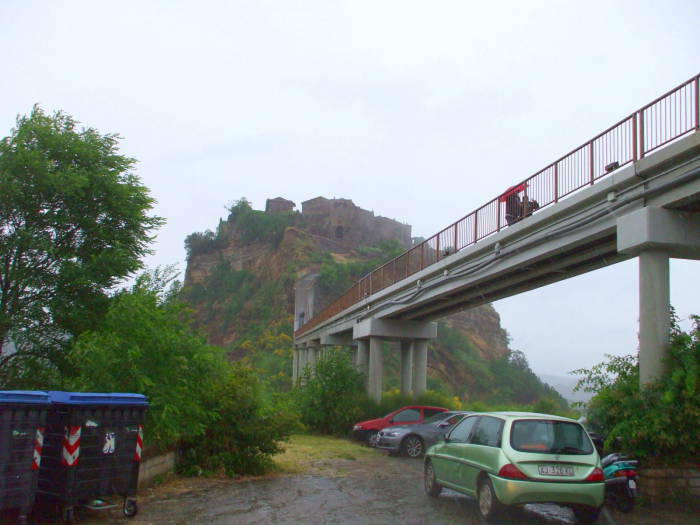 Parking in Orvieto is pretty much limited to residents, so park down by the train station and ride the funicular railway up to the walled city on top of the cliffs. This was the site of a series of Papal palaces and homes of the Popes from 1154 through 1527. In the late 1200s the Pope spent more time in Orvieto than in Rome, and there was discussion over whether Rome should remain the papal city. 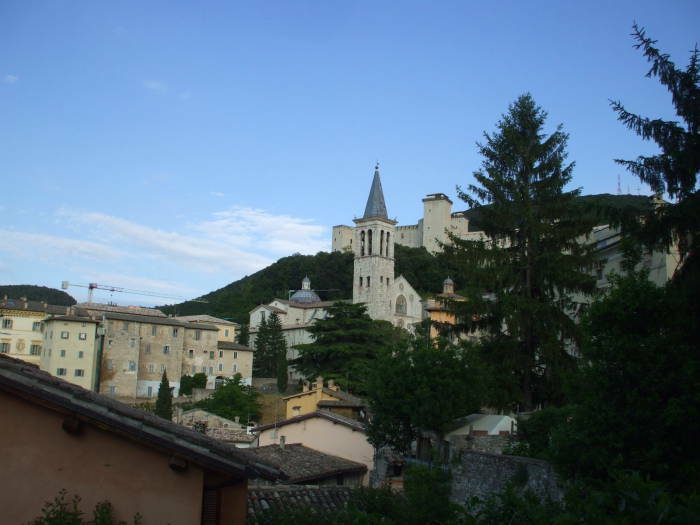 The hill town here, like the one shown at the very top of this page, is in south-central Umbria, between Assisi and Spoleto. 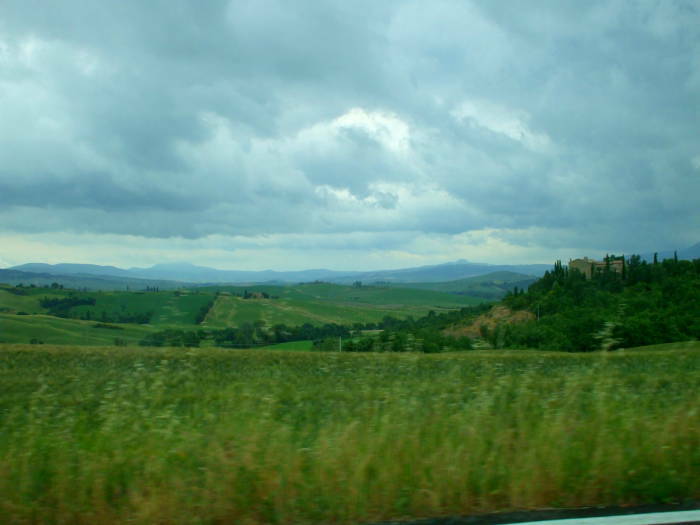 These pictures are from a drive west from Perugia across north-central Umbria and slightly into Tuscany, to the town of Montalcino. 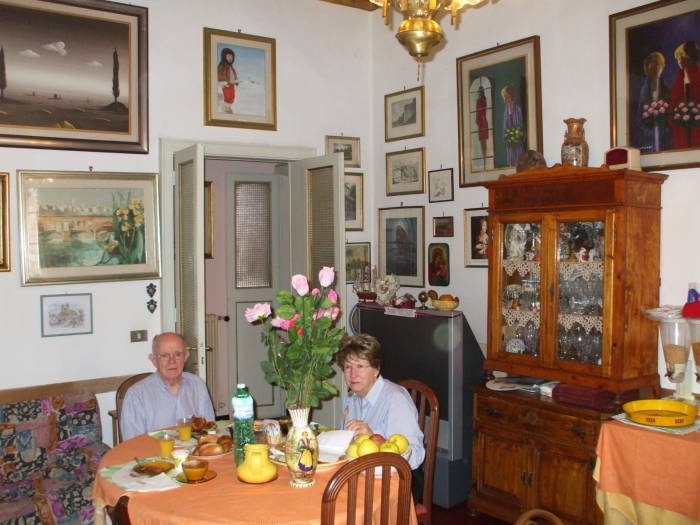 You will see several villas and signs for agriturismo, an Italian form of agricultural bed and breakfast. 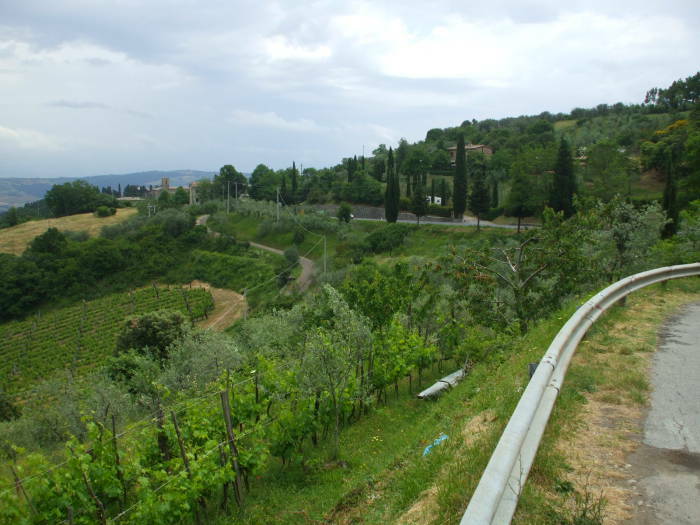 The last picture above is from the approach to Montalcino, and the next two pictures below show the views from the edge of town. 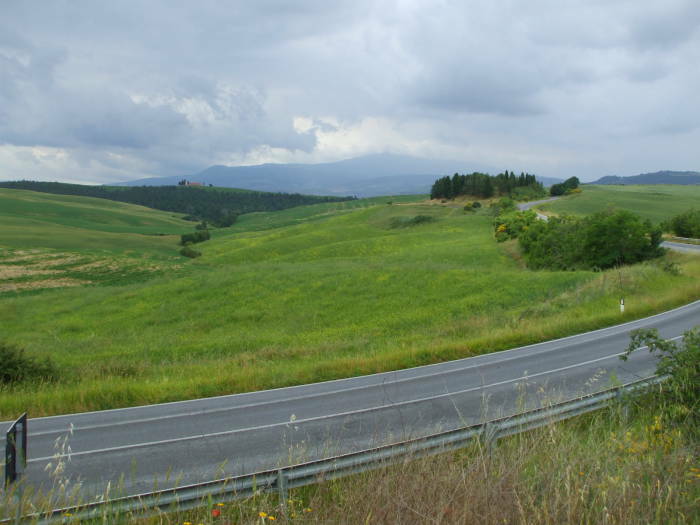 As with many small hill towns, you don't want to try to drive into Montalcino. There's nowhere to park, really almost no space to maneuver a car, and it's a small place. Park just outside the town walls and walk in. 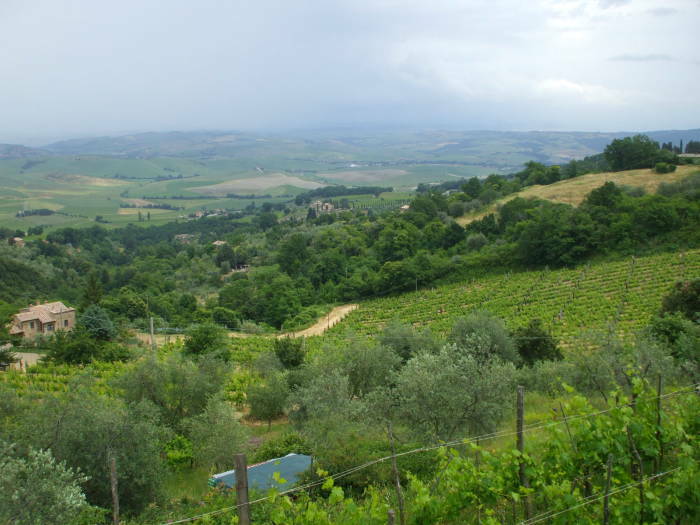 DOCG — Denominazione di Origine Controllata e Garantita or "Controlled and Guaranteed Origin Denomination", the highest Italian quality assurance label. DOC — the next level down, simply Denominazione di Origine Controllata or "Controlled Origin Denomination". IGT — Indicazione geografica tipica or "Indication of Geographic Type", for high-quality wines that do not fit DOC/DOCG regulations. That's 44 pages of wine, 25 pages just for the local wines from a town with a population of just 5,131 in its commune.